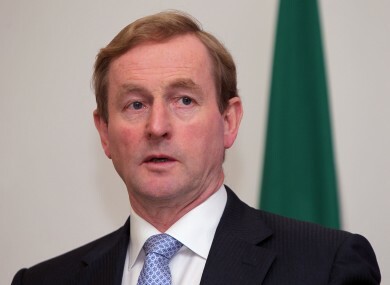 File photo of Enda Kenny. TAOISEACH ENDA KENNY has said the property tax, the details of which were announced in the budget today is “both progressive and fair”. The Local Propery Tax, as it is called, will be introduced next year to replace the household charge and will be charged at 0.18 per cent of the market value for houses worth under €1 milion. Properties valued at more than that will be charged at 0.25 per cent of market value. Speaking in an interview on RTE Nine News this evening Kenny said the decision to introduce the tax was progressive and fair because “everyone contributes to this” and the vast majority of money collected will be used by local authorities. “For people who have real difficulties, and there are many, with mortgage difficulties and so on, there are a range of deferral options,” he said. He said the important emphasis has to be to move the country forward so that jobs can be created. “Against a background of great difficulty at a European level, signs of confidence returning to the economy are evident,” he added. Email “Taoiseach: Property tax is "both progressive and fair"”. Feedback on “Taoiseach: Property tax is "both progressive and fair"”.